This is a single vineyard Sauvignon from the highly rated winemaker Brent Marris. Zesty and fruity with a brilliant smoky herbal twist, this delicious fresh white has characteristic lime and gooseberry flavours. A single-vineyard wine, grown on stony alluvial soil close to the Waihopai River. Zesty and fruity, it has characteristic blackcurrant leaf and gooseberry flavours with a great smoky, herbal twist. Brent Marris took the name from The Ned, a rugged peak nearby. It's excellent with fresh and smoked salmon, oysters or spicy prawns. 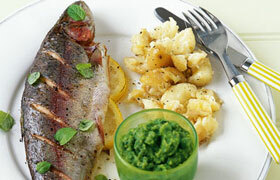 Light, fresh pink trout combined with rich, creamed spinach is a perfect match to this typical New Zealand Sauvignon Blanc. Crisp, fresh flavours dance on your taste buds but without over powering the delicate fish.